Standing in front of an Iranian rocket fired at an international airport in Saudi Arabia, U.S. Ambassador to the United Nations Nikki Haley said Iran must stop all its destabilizing behavior. “We are not just focused on [Iran’s] nuclear program,” the ambassador said during a press conference at a Joint Base Anacostia-Bolling hangar where the illegal Iranian equipment is on display. The display is hard evidence that Iran is seeking to destabilize the Middle East. 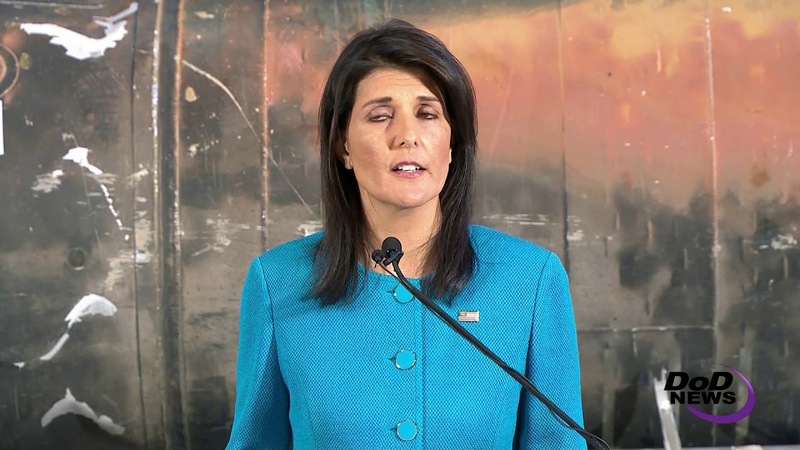 Haley stressed that Iran is engaging in many other illegal behaviors that are causing suffering from the Arabian Peninsula, to Central Asia, to the Levant. And Iran’s behavior is growing worse, she said. “The nuclear deal has done nothing to moderate the regime’s conduct in other areas,” the ambassador said. The instance of missile and weapons systems being sent from Iran’s Revolutionary Guard to militias and terror groups is increasing. “It’s hard to find a terrorist group in the Middle East that does not have Iran’s fingerprints all over it,” she said. Iran is “fanning the flames” of conflict, Haley said. The report shows Iran arming Houthi rebels in Yemen with missiles and advanced weaponry, and that is what brought Haley to a hangar near the Defense Intelligence Agency here. The displays in the hangar are irrefutable, concrete proof of Iran’s violations. Missiles, unmanned aerial vehicles, antitank weapons and a Shark-33 boat used to attack a Saudi frigate are among the displays. Examination of the weapons trace them back to Iran and industries owned and operated by the Iranian government or Iran’s Revolutionary Guards. 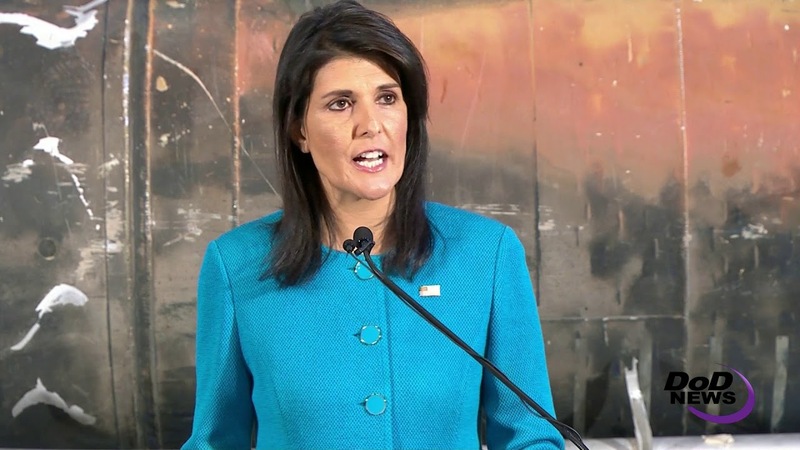 “This evidence demonstrates a pattern of behavior in which Iran sows conflict and extremism in direct violation of U.N. Security Council resolutions,” she said.